Structural Firefighting Situations That Shout "Watch Out"
Locate the fireline as close to the fire edge as possible. This generally means a direct attack which provides firefighters more safety as they can usually get into the burned area for a safety zone. 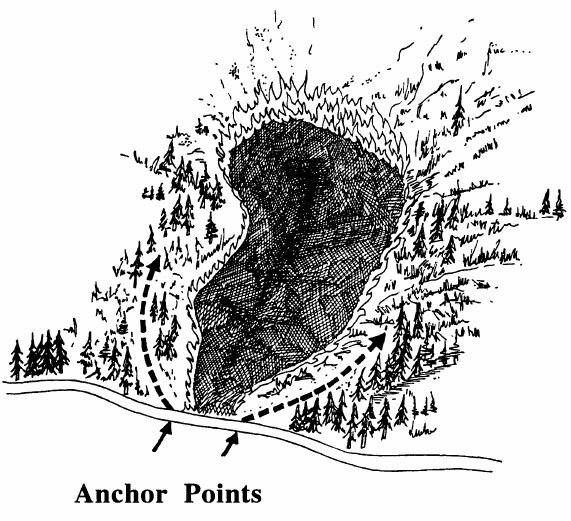 Always anchor the fireline to a barrier or other control line to prevent being outflanked by the fire (see Figure 8). Barriers can be natural or human made i.e., roads, trails, rivers, lakes, old bums, rocks. Also burn out the fuels between the fireline and the fire edge beginning at the anchor point and continue burning out as the fireline is constructed. If the fire is spreading rapidly or is too hot for direct attack, place the fireline far enough back from the fire's edge to allow sufficient time for fireline construction and burning out to be completed safely. 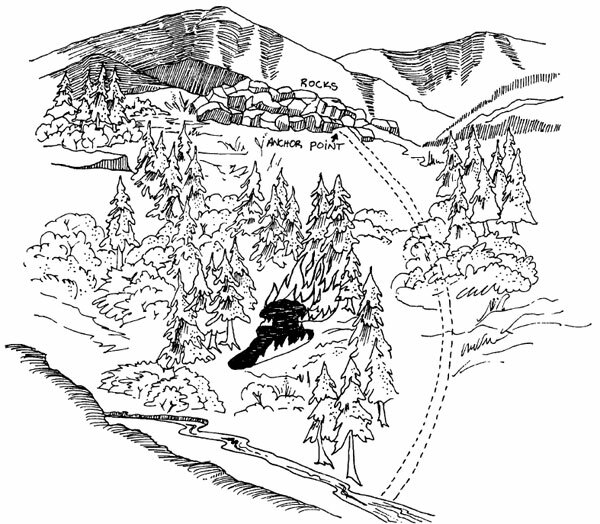 Avoid downhill fireline construction with the fire directly below. Building fireline downhill when fire (either wildland fire, burnout, or a backfire) is directly below you can be hazardous and is one of the Watch Out Situations (see Figure 9). Fire spreads more rapidly upslope. Firefighters above the fire building fireline downhill can easily be outflanked or overrun by the fire. The decision is made by a competent fireline supervisor after thorough scouting. Downhill fireline construction should not be attempted when fire is present directly below the proposed starting point. The fireline should not be in or adjacent to a chimney or chute that could bum out while firefighters are in the vicinity. Communication is established between firefighters working downhill and firefighters working toward them from below. When neither crew can adequately observe the fire, communications will be established between the crews, supervising overhead, and a lookout posted where the fire's behavior can be continuously observed. Firefighters will be able to rapidly reach a safety zone from any point along the line if the fire unexpectedly crosses below them. A downhill fireline will be securely anchored at the top. Avoid underslung line if at all practical. 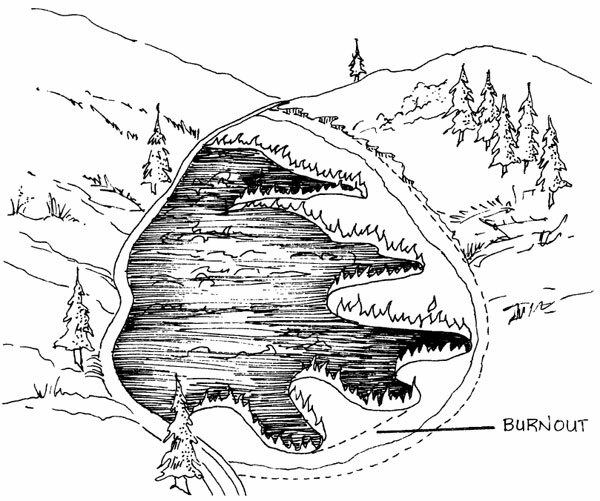 Burning out should be done as the fireline progresses, beginning from the anchor point at the top. The burned out area provides a continuous safety zone for firefighters and reduces the likelihood of fire crossing the line. Be aware of and recognize the Watch Out Situations. Full compliance with the Fire Orders is assured. Fireline should not be constructed in or adjacent to chutes or box canyons that can channel the fire and produce extreme fire behavior (see Figure 10). Make the firelineas short as possible (see Figure 11). Tie ends of fingers together with a fireline and promptly bum out. Cold trailing is a method of using the extinguished edge of a fire as the fireline. The cold fire edge must be carefully inspected to detect any fire and every live spot must be lined and extinguished. Cold trailing can shorten the fireline to be constructed, but must be accomplished with caution. Capitalize on existing barriers to fire spread in selecting fireline location. When possible put the fireline through open areas to reduce clearing work. Avoid sharp angles in the fireline. 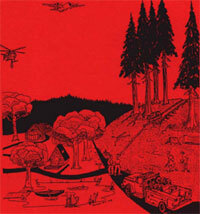 Block off high hazard fuels where possible by leaving them outside the fireline. 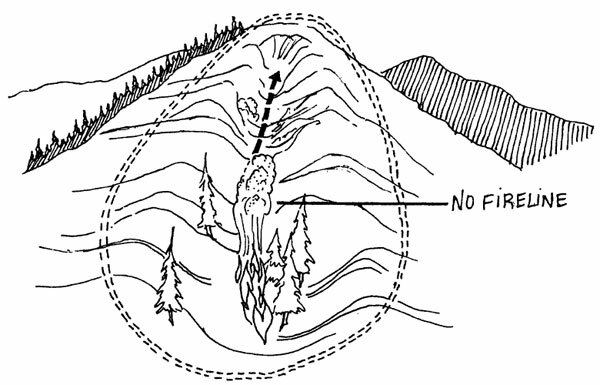 When constructing fireline on a ridgetop, locate the fireline on the back side of the ridge (see Figure 12). When constructing fireline in the bottom of a canyon locate line on the opposite side to prevent underslung line and the need for cup trenching (see Figure 13). 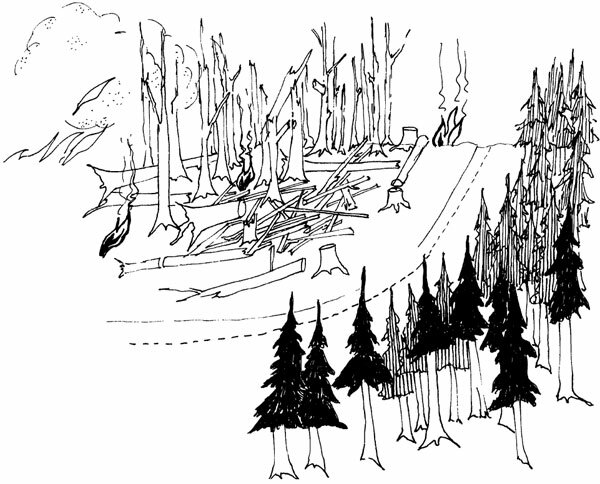 Locate the fireline far enough away from burning snags to enclose them if they fall over or are cut down (see Figure 14). Encircle the area where spot fires are so numerous that individual control of them is impracticable. 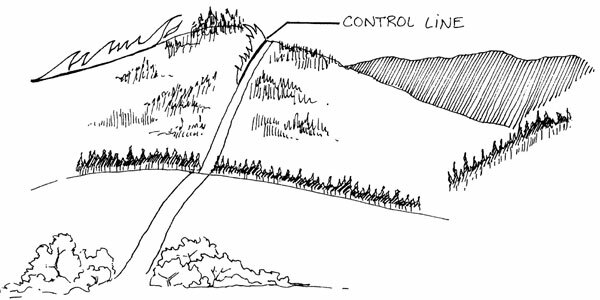 Where a definite topographic feature, such as a ridge, cannot be used for fireline location, oblique (slanting) lines should be used for frontal attack to pinch off the fire head, rather than a line squarely across the front. Take advantage of the normal daily shift between local up-canyon drafts during the day and down-canyon winds during the night. Unless general winds counter the effect of local drafts, fires generally burn up-canyon during the day and down-canyon at night.